Thanks for sharing this Paul. Awesome! Simple and effective, as usual. Would it work with a 1″ chisel? I have one with a broken tang – i did braze it back on, but I don’t use it. obviously would use thicker body. Yes it will. And the thickness of the body is immaterial. Paul, is that the Stanley folding knife you’re using to mark those knife walls, around 5-6 minutes in? I’m considering picking it up off of Amazon. I also would like to try out a chip knife like Roy Underhill uses, but the Stanley folding knife is cheap enough, and I’m confident I will have a use for it even if it doesn’t turn into my go-to marking knife. 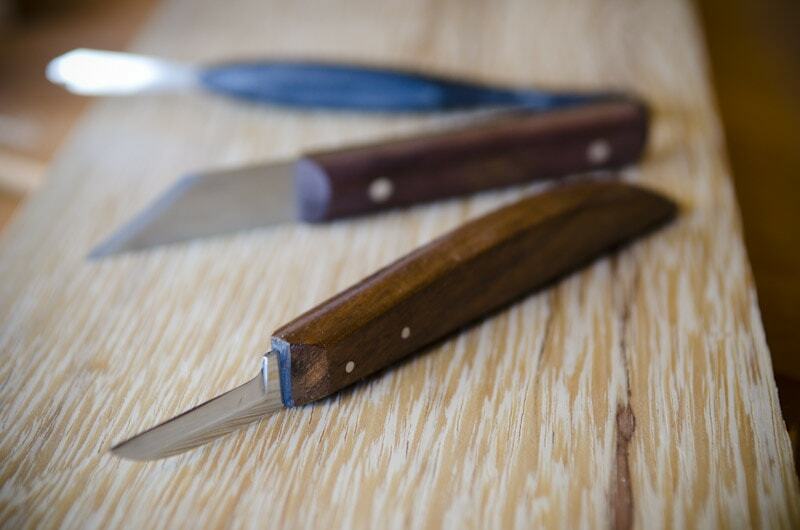 Stanley makes two types of folding pocket knife. The UK version is lighter weight and more refined. I don’t know what’s on Amazon without going and looking and i never watched Roy Underhill either I am afraid. If you’re in the US the UK version is available for $12.50 shipped on ebay from Bigredtoolbox or something like that. It’s quite a bit more on Amazon. Thanks – I think I saw something from them when searching the internet. We’ll see what I wound up with for this order. It certainly wasn’t expensive, and I know I’ll find a use for it around here regardless. Sone time ago I cut out and planed the remains of an old oak fence post that became redundant when I renewed the fence. Bottom had rotted badly but much of the top was usable. One piece was approx rebate plane size. So I have modified the old broken 1″ chisel. Cut the block of oak square, marked it out and cut out the channel for the blade. Did this on my recently made my version of Pauls bench and used my version of Pauls allen key router to level the blade base of the blade groove. Next step is to make the wedge, width guide, depth stop (I know Paul didn’t add one) and refine the body. There is still a nail hole in the body, but when I shape the front I hope it will disappear, if not it just shows that it has been recycled. I have been trying to justify the price of a 78 on ebay. This has satisfied that desire. Hopefully, using oak it will outlast me. A very big thanks Paul. Good man Keith, that’s quite inspiring to say the least! Nice vid, Paul. and a clever use of drop out chisels. By the way, “rabbet” is an english word very few person would understand in france. The right translation is “feuillure”. Mmmm….. ‘bunny feuillure’….. doesn’t have quite the same ring to it. Would it be a good idea to make two of these? I can’t imagine you would want to be planing against the grain if you were to do the other side of the board. And thanks, this is one of your best videos yet! You could indeed. You should see the next one for YT coming up. You will love this one. Paul thank you so much for putting your videos on youtube. I would love to come to your shop and work with you one on one. With this I feel like I am. I love all your videos and have added your channel as a fav of mine. Thank you so much. You have changed my mind when it comes to hand tools and helped me fall in love with fine woodworking. This is what I wanted to do as a carpenter. Unfortunately in North America the carpenters trade has gone from a masters work to nothing more than slop with a good shovel full of apathy and disrespect for the trade. I really appreciate you taking us back to the roots of what a carpenter is. Isn’t that what a carpenter used to be? A woodworker that made everything he had in his house an workshop? I can take pride in making my shop what I want it to be now and take my skills to a new higher level than I ever thought possible because of your generosity. I just finished making my rebate plane tonight, using an extra 1/2” chisel I had. This is a very rewarding project that takes just a small amount of time. I’ll have to spend a little more time refining the wedge, it won’t curl out the shaving like yours did. Do you still recommend a 078 Stanley or…? fillister or rebate plane? yes, very useful planes to own. I built one after watching your video, using a 1/4″ chisel. Made from oak with a black walnut wedge, and it works great. Mine is much smaller, so I used a gouge to cut a semi-circle recess adjacent to the bottom of the wedge. This cutout really helps evacuate chips. Just need to engineer a slightly better fence, my version is pretty choppy! I just watched your Youtube video on making the poor man’s rebate plane. It was very inspiring and educational, but I have one question please. Since the end of the blade hits the fence, so theoretically it will be at exactly the same plane (no pun intended) as the wood you are planing… how does it bite into the wood? The fence is over the cutting edge and adjusted to width. Obviously this causes a small cut in the fence to accomodate that section of the blade not being used. Thanks a lot, sir, for accomodating a confusion of my “button down” mind. If you mentioned this explanation already in the video please forgive me. Thanks again for all your time and giving to all of us. A couple of questions. (I’ve watched the video a couple of times, so apologies if you explained these and I just missed it). 1) What angle should the chisel be ground to? 2) Near the start you mark the front of the rebate at a 100/80 degree angle to help lock the wedge in place, but later on you then pare this back to 90 degrees. Did I miss something there? Sorry, Dave. I don’t keep so many numbers in my head any more I’m afraid. If I find time I will try to take a look. I´m planning to do a rebate plane as in the youtube video, but I have a doubt. In case the fibers grain point in oposite direction we wouldn´t be able to use the rebate plane in proper way, so should we build two planes? one on the right side an other on the left? It was standard to have two opposite planes but then if the blade is ground the plane can be used either side of the plane and resolve the problem. It’s an ex firmer chisel so the sides of the chisel have 1-2 degree relief bevel.